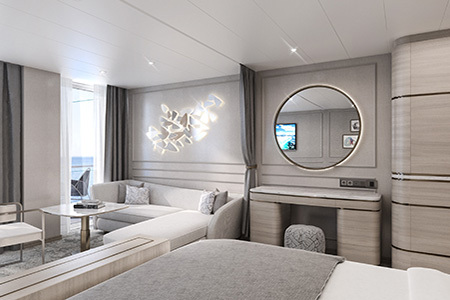 The Expedition Suite features a one-bedroom layout that connects to an adjacent Deluxe Suite through an adjoining entry, ideal for families and friends traveling together. It offers a dedicated dining area and butlers prep space for in-suite dining from any of Crystal Endeavors Michelin-level eateries. 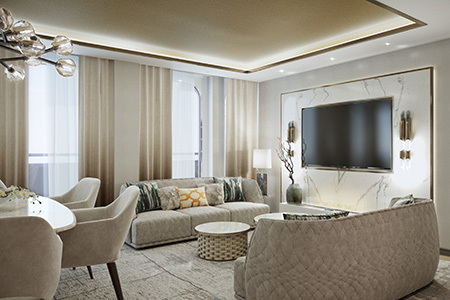 The Owner's Suite features a two-bedroom suite, with a dedicated dining area and butlers prep space for in-suite dining from any of Crystal Endeavors Michelin-level eateries. 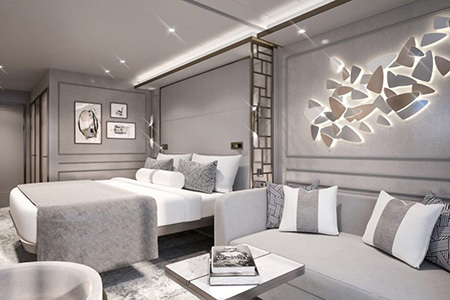 The Expedition Suite is a one-bedroom suite with a dedicated dining area and butlers prep space for in-suite dining from any of Crystal Endeavors Michelin-level eateries. The Penthouse Suites offer separated sleeping and sitting areas, private verandahs, desk vanity areas and butler service. Luxury touches include king-sized beds. walk-in closets. heated storage for drying parkas, and spa-like bathrooms with adjustable heated floors, dual vanities, anti-fog mirrors and rain-showerheads. State-of-the-art technological amenities include ambient lighting, interactive streaming TVs and bedside iPads. The Deluxe Suites offer separated sleeping and sitting areas, private verandahs, desk vanity areas and butler service. Luxury touches include king-sized beds. walk-in closets. heated storage for drying parkas, and spa-like bathrooms with adjustable heated floors, dual vanities, anti-fog mirrors and rain-showerheads. State-of-the-art technological amenities include ambient lighting, interactive streaming TVs and bedside iPads.